The 900-watt program, ultra compact single 12-inch active PS12S bass reflex subwoofer is the ideal companion sub for the PS10P full range loudspeaker system. Solid 15mm birch plywood cabinet construction and an efficient Class-D power amplifier design provide unmatched long-term reliability in the field. 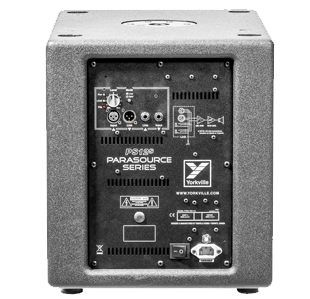 Capable of direct connection to any audio source (including speaker level input) the PS12S can be easily integrated in to virtually any small or medium format PA application. 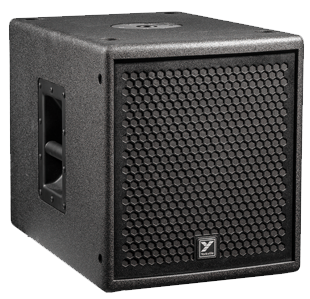 We are very pleased with the performance of these speakers for our live worship band. We use them in a 200 seat theatre with padded sound absorption walls - so the speakers need to pack a punch - and they do. Very clean, pure bass sound. They are also easy to set up and don't weigh a ton like some powered subs we have used previously. I bought these for small dance parties/weddings/karaoke of 100 people or less. These little boxes have a purpose. They are very loud and can handle the punishment. I am going to be real about this post. They do NOT have the deep bass of an 18" or a 15". But they do have the PUNCH of a 15", no problem. I demo'd all three subs side by side. I would not use these for 200 people or teens in a large hall, but anything in close-quarters like a bar, lounge, jazz club or a large foyer for jazz musicians or karaoke, these are the perfect sub. They would also be good to mic a kick drum. I am a former owner of YORKVILLE's PS system, 4 double 12" subs, 4 PS tops. I have a pretty good idea what this little subs limitations are....and there are not many, except for LARGE venues with lot's of people. I had originally booked the 15" but by the time I got to the store only the 12" were left. I wasn't sure what to expect because i was djing at the 18th birthday party and the hall was filled with 200 guests with a capacity of 250. I kid you not, the sound was amazing. I had two EV zlx 12" tops and boy unbelievable. The requested music was mainly HipHop and you know how Hip Hop needs the bass. The nice warm bass was punching right across the room. Not only me, but even some of the guests were complimenting on how could such a punch come out of such a little sub. Rent them out and try them for yourself and see. Amazing is the word! I have try them at Long-Mcquade laval and i was truly stunned. They sound a lot better then the Yamaha DXS12 and are smaller and go deeper. Plus they are very accurate subs. At 60 lbs you can lift one in each hands ! so very portable.